When we attended JoeLanta last year, we met the band, Radio Cult, who rocked the Marriott Conference room with a set of 1980’s covers, some of which you’ve seen here in PopCult (most recently as our ninth Christmas Treat). 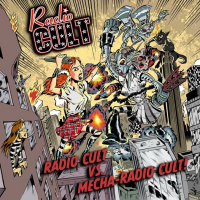 Recently the band created a really cool video for their original song, “Get Out Of This Town,” from their CD, “Never Enough.” They also released a new cover CD called “Radio Cult vs. MechaRadio Cult.” You can purchase the new CDs as well as their others from their website. We hope to catch them again when we return to JoeLanta in March 2014, but until then, check out the video. It’s got ninjas and cool stuff in it. You’ll be hearing much more about JoeLanta as it approaches.